Porcelain by Pam: Do you hear anything? 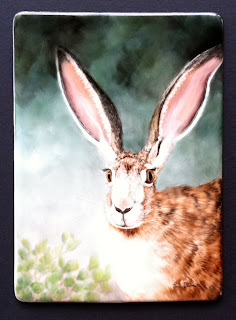 This is a 5 by 7 porcelain painting on a porcelain tile with a very alert jackrabbit looking and listening. One of the things I enjoy about painting is that I get to know the subject in ways that I never would. Did you know jackrabbits had such long eyelashes. Imagine looking at the world with your eyes on each side of your head? I think I have pretty big ears until I look at this guy!